Car & Driver Entry/Tech Card only - Includes 1 Vehicle Pass - Kids Under 12 FREE. - (SAT-SUN) Includes comped entry into a Bracket Class on Sunday. RV/MOTORHOME TRACKSIDE SPOT WITH NO ELECTRICAL Does NOT include Event Entry. Ford Drag Racing returns to Gateway Motorsports Park as the NMRA Gateway Rumble comes to Illinois in May. From exciting 275 radial action in VP Racing Fuels Street Outlaws and Boost-loving Edelbrock Renegade race cars, the Gateway Rumble will be the biggest Ford and Mustang event to hit the Midwest in 2019. Get in where you fit inQA1 True Street is open to all Ford enthusiasts, a special Gateway Rumble will put the Top 16 True Street racers into a heads-up race to see who is the baddest street car in the Ford universe. All NMRA events feature a Car Show for early and late-model Fords and Mustangs. 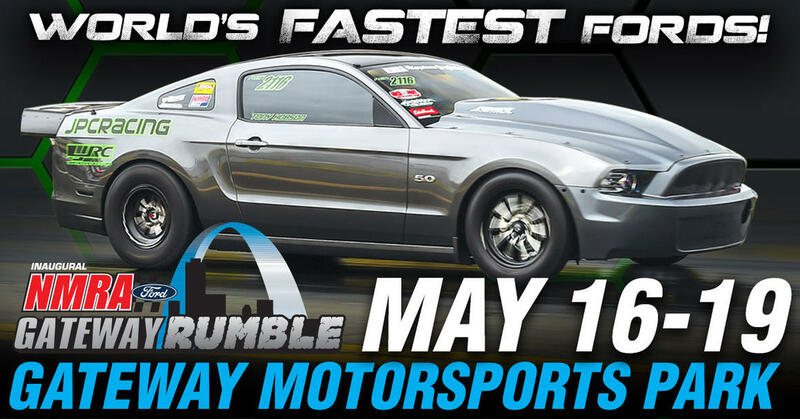 The inaugural NMRA Gateway Rumble visits Gateway Motorsports Park May 16-19 and the facility steeped in Mustang drag racing history. As one of the crown jewel of facilities in the Mid-west, the St. Louis area motorsports facility has hosted some of the biggest Ford events in drag racing history and NMRA is returning in 2019. Every NMRA event includes 2,000+ HP Street Outlaws that race in a heads-up, side-by-side drag race. Fans will be treated to awesome Blue Oval drag racing, including Coyote Stock, Renegade, Super Stang, Modular Muscle, and much more! On Sunday, the Gateway Rumble gets cranking as the quickest 16 cars from Saturdays QA1 True Street competition compete heads-up for even more cash, prizes and magazine coverage. To be eligible for the Gateway Rumble, competitors must meet QA1 True Street rules and make all three passes on Saturday. Going down Friday, Saturday, and Sunday is a huge Manufacturer's Midway packed with vendors and representatives from some of the best aftermarket companies in the industry. A giant all-Ford Car Show is another part of the NMRA experience where early- and late-model Fords will compete for trophies on Saturday and Sunday. If you have a street legal ride, the True Street class is open to anyone with the desire to go fast. After a 30-mile cruise, all True Street cars get three back-to-back runs down the quarter-mile for the chance to win prizes. Officials give away eight winning trophies for True Street with an Overall Winner and Runner-Up and segment winners with the quickest average for 9-second, 10-second, 11-second, 12-second, 13-second, 14-second, and 15-second zones. Buy a new car at the Ford dealer the morning of the event or borrow your neighbors SUVFord vehicles of all types and performance levels are allowed to enter.